Maximise your parking area and ensure every inch of speech is being utilised efficiently. Autolift is the market leader in the manufacture, supply and installation of mesh car park storage cages, partitions, bike lockers and tilt garage doors in Sydney. We are able to convert any open space into multiple or singular secure areas. Autolift can convert a single car space, a complete garage or warehouse, or random individual spaces. We can also integrate remote handsets to work simultaneously with main entry doors and individual car park spaces. Autolift welded mesh partitions and cages for storage can be manufactured and installed to separate commercial or car parking areas or to provide a secure, lockable area in a basement or warehouse. Our mesh partitions are the simplest and most commonly used partitions and are usually supplied with a matching perforated tilt garage door. Partitions are strong, cost effective, secure and do not interfere with the flow of water or the movement of air. The non-intrusive nature of mesh partitions make them well suited for large multi-storey car parks in large residential blocks. 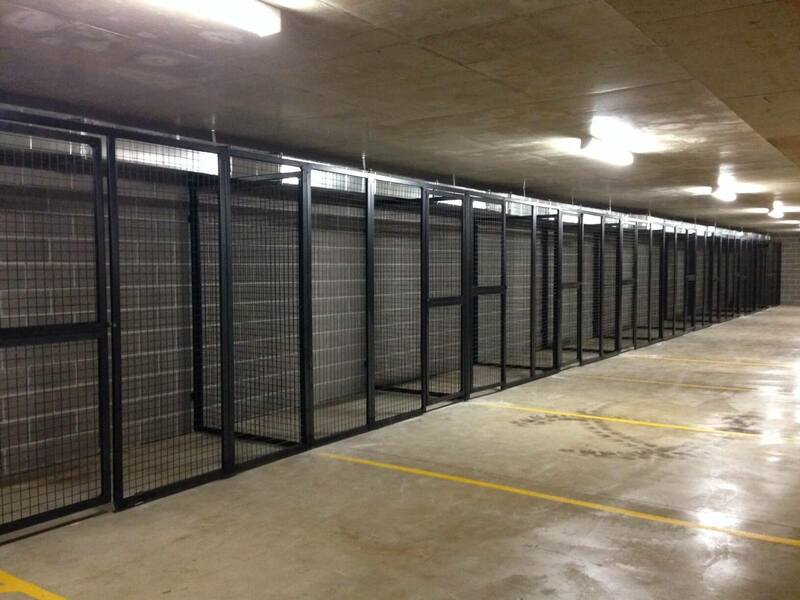 The design of our car park storage cages available in Sydney allows individual tenants to have secure car parking spaces without impacting other tenants. Furthermore, if a tenant chooses not to install a secure car parking space and then changes their mind at a later stage, the mesh for each space can be retrofitted and integrated into the rest of the car parking spaces. Whether to protect or secure your vehicle, for a bike locker, or to allow secure storage for sports gear or other belongings, a mesh partition and tilt door provides a good solution for your needs. In some cases the requirement is not for a secure parking area, but rather for a secure space to store your belongings. When space is at a premium, the solution may be to create a secure storage box positioned over your car’s bonnet. This box can be custom built to any size you require out of welded mesh. Once again, this style of storage box will not significantly interfere with ventilation or fire protection systems. This storage box is ideal to secure your sporting equipment and other items, or to serve as a bike locker. It also allows you to de-clutter your living space whilst still having access to your belongings as you need them. Where space is available, a mesh storage cage can be built from floor to ceiling, allowing you to maximise all available space by using it as a secure storage area. Where ventilation and sprinkler systems requirements allow, a perforated Colorbond or Zincalume storage cage may be the solution you are looking for. Perforated partitions and storage cages will provide significantly more privacy whilst still allowing for 50% ventilation. The perforated tilt doors can be fully automated and integrated into a system which allows a single remote handset to be used to control the main entry door as a common system and a single tilt door as a separate secure system.